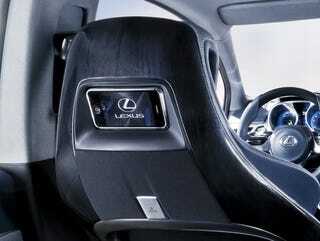 Lexus LF-Ch Concept Has Headrest-Mounted iPhone Docks! The coolest part of the now fully-revealed hybrid Lexus LF-Ch Concept? The rear seat headrest-mounted iPhone docks. We can't wait to try them out in person at the Frankfurt Motor Show just to see if we can watch naughty videos. Lexus LF-Ch Concept: Premium. Hybrid. Sorta Small. The LF-Ch has four sport seats that feature trim lighting along the cushion's edge for cabin illumination. Rear passengers can enjoy headrest-mounted iPhone® docking capability for audio and video entertainment. In addition, the LF-Ch has storage in the rear seat armrests for small items such as iPods®, PDAs and cell phones."